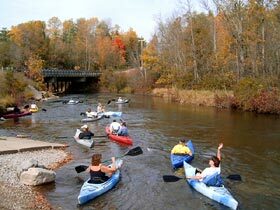 Trips down the Manistee River are an unique experience that should be taken when you are able to spend enough time to truly enjoy the leisurely float downstream, and have the time to “pull over” for a picnic, exploring, or just relaxing on the bank. The river is noted for its constant water flow. One will never have to portage; there is always enough water over gravel beds and sand bars to float over. This is a very pristine river system with hundreds of crystal clear smaller rivers and pure water springs flowing into it, and with very little development along its banks. This is the shortest length trip. Mainly used for tube & raft trips. 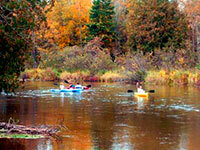 This trip distinguishes the Manistee River from trips on other rivers. It is relatively unsettled and unspoiled, with towering hills, clear water gravel beds, sand bars for swimming, and plenty of places to pull over. There are islands to explore, abundant wildlife, and many tributaries flowing into the river to join you in the float downstream. It is the trip that everyone comes back to do over again, because one trip is never enough to enjoy the beauty of this stretch of the Manistee River. This is a full day canoe, or kayak trip. This is the trip for people who want to start early, and spend the whole day enjoying the river. For the fishermen, the opportunities are endless. 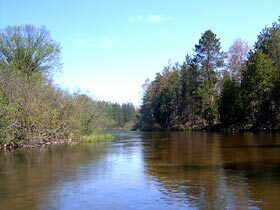 The Manistee is a wonderful, cool, clean water fishery for both the fly fishermen and the bait fishermen. 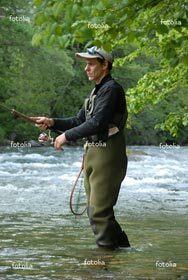 Many sections of the river never see any fishing pressure, and there will be an endless number of smaller creeks that flow into the main river that are also great for fishing. Browns, rainbows, brook trout, and walleye are the main targeted species. 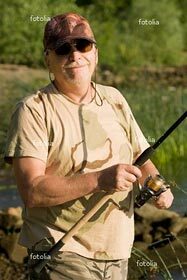 But there are also pike, smallmouth bass, and sturgeon just to name a few. And the subject can’t be concluded without mentioning the great hex hatch that occurs every year on the river. The Manistee River has always been rated as one as the best in the country for camping along its banks, and canoeing for as many days as your schedule allows. 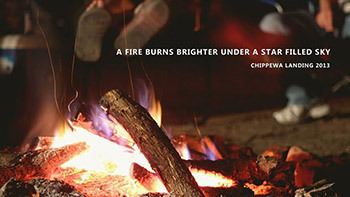 Chippewa Landing can help you plan a great trip on the Manistee River, an unspoiled, natural river. 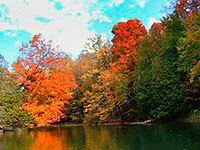 There are miles and miles of great camping spots along the mostly public land that the Manistee River flows through. Camping can be at the river level, or on a high bluff overlooking miles and miles of Northern Michigan forest, or along side a babbling creek. This is a good overnight trip, with plenty of pristine places to camp. Allow 4-5 hours each day on the river. Spend three days on this trip with 3 to 4 hours on the river each day. This distance could be done in two days with a lot of paddling, or four days with a lot of stops for fishing, exploring, or just relaxing. This will be a four or five day trip. The river is quite different for the first day, with a lot of shallow water (no portages), and low banks. This is the start of the "flies only" stretch of river, and no live bait is allowed to be used above this bridge. This is for the serious, long-term canoeing experience. There will be shallow water, and obstacles to go around for the first couple of days. Spring trips are always a great time of year to get out, with long warm days, (daylight until 10:00 at night), and cool nights that are great for sleeping. The wildlife will be out in full vigor along the river and the spring noises from the birds and spring peepers (frogs) at night are superb. With the river flowing through hardwood forests and encased in tall bluffs, the Manistee River is a great way to see the autumn colors on a fall canoe, kayak or raft trip, which are wonderfully enhanced by the reflection of the water.